Purpose To compare ultrasound (US) measurements in the sagittal and axial plane of the plantar aponeurosis (PA) in healthy subjects. Materials and Methods PA thickness was measured in 40 healthy subjects (mean age: 34 years) by two radiologists using US in sagittal, axial medial and axial lateral planes. Subjects were classified according to gender (female and male) and age (18 – 35 versus 50 – 75 years). All measurements were compared and the interobserver agreement was calculated. Results The PA was medially significantly thicker than laterally (mean ± std 3.1 ± 0.7 mm versus 2.5 ± 0.5 mm respectively, P< 0.001). A significant difference was found between males and females (3.3 ± 0.7 mm versus 2.9 ± 0.6 mm medially and 2.7 ± 0.6 mm versus 2.3 ± 0.4 mm laterally, p < 0.05) and between the older and younger age groups (3.8 ± 0.6 mm versus 2.8 ± 0.4 mm medially and 3.1 ± 0.4 mm versus 2.3 ± 0.4 mm laterally, p < 0.001). Good interobserver agreement was detected (0.74). Conclusion Measurement of central and lateral fascicles of the plantar aponeurosis in both planes (sagittal and axial) is recommended in the daily routine. 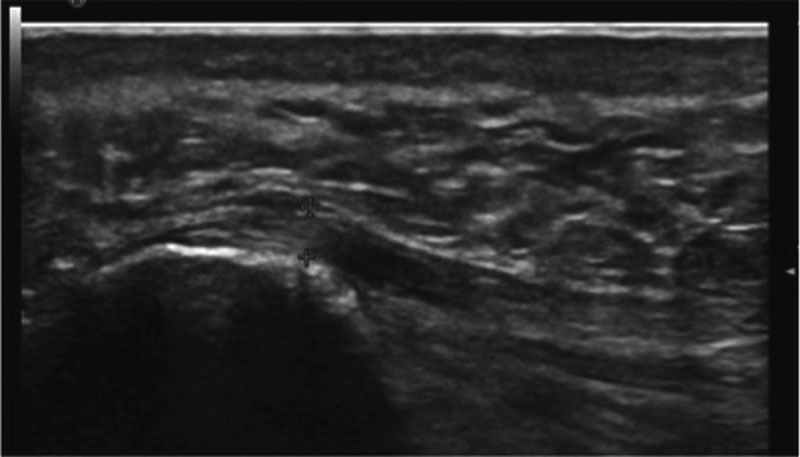 US examination of the central and lateral fascicles of the PA was feasible. PA thickness measurements showed significant differences based on age and gender. There was good interobserver correlation between both examiners despite the major difference in experience. Scanning of two planes for the PA is recommended in the daily routine. PA thickness measurement by US is a fast and reliable method for junior radiologists. Ziel Vergleich von Ultraschall (US)-Messungen in sagittaler und axialer Ebene an der Aponeurosis plantaris (PA) bei gesunden Personen. Material und Methoden Die PA-Dicke wurde bei 40 gesunden Personen (mittleres Alter 34 Jahre) von 2 Radiologen mittels US in sagittaler, axial medialer und axial lateraler Ebene gemessen. Die Teilnehmer wurden entsprechend ihres Geschlechts (weiblich/männlich) und ihres Alters (18 – 35 versus 50 – 75 Jahre) klassifiziert. Alle Messungen wurden verglichen und das Inter-Observer-Agreement berechnet. Ergebnisse PA war medial signifikant dicker als lateral (mean± std 3,1 ± 0,7 mm versus 2,5 ± 0,5 mm, p < 0,001). Ein signifikanter Unterschied wurde auch zwischen männlichen und weiblichen Personen (3,3 ± 0,7 mm versus 2,9 ± 0,6 mm medial und 2,7 ± 0,6 mm versus 2,3 ± 0,4 mm lateral, p < 0,05) und zwischen der älteren und jüngeren Altersgruppe (3,8 ± 0,6 mm versus 2,8 ± 0,4 mm medial und 3,1 ± 0,4 mm versus 2,3 ± 0,4 mm lateral, p < 0,001) gefunden. Ein gutes Inter-Observer-Agreement (0,74) wurde beobachtet. Schlussfolgerungen Die US-Messung der PA-Dicke in 2 verschiedenen Messebenen (sagittal und axial) kann für den klinischen Einsatz als Routine-Standardmethode empfohlen werden. Die US-Untersuchung der zentralen und lateralen Faszikel der PA war möglich. Die PA-Dickenmessung zeigte signifikante Unterschiede zwischen Geschlechts- und Altersgruppen. Gutes Inter-Observer-Agreement trotz deutlicher Erfahrungsunterschiede. Untersuchung der PA in 2 Ebenen wird für die Routine empfohlen. Die PA-Dickenmessung mittels US ist eine schnelle und zuverlässige Methode für Nachwuchsradiologen. The plantar fascia (PF) is a broad structure that spans between the medial calcaneal tubercle and the proximal phalanges of the toes. Also called the plantar aponeurosis (PA), it is comprised mainly of three bundles: central, lateral, and medial . The central bundle is the thickest of the three bundles and is thicker proximally and thinner distally as it thins out along its course until its insertion, covering the flexor digitorum brevis muscle, dividing into five digitations that insert into the metatarsophalangeal joints. The lateral portion is thinner than the central, but also thicker proximally and thins out distally. It arises from the lateral portion of the medial calcaneal tubercle and covers the abductor digiti minimi muscle in its course, where it extends distally to insert into the capsule of the fifth metatarsal joint. The medial portion is thinner than the two other portions and arises from the mid-portion of the central tendon and inserts into the first metatarsal joint capsule covering the plantar surface of the abductor hallicus muscle in its way  . Imaging of the PA is feasible by using multiple imaging modalities, but ultrasound (US) was preferred in many publications over other modalities due to its various advantages      . PA thickening is one of the most common US findings used for the diagnosis of plantar fasciitis. However, its complex anatomic structure including 3 different fascicles warrants careful and meticulous investigation. Detailed knowledge of its normal anatomy and its main parts may enable detection of abnormal changes and pathology earlier in the course of the disease, allowing timely diagnosis and treatment . The evaluation of PA thickness for the diagnosis of plantar fasciitis is usually evaluated at the point of maximum thickness in the sagittal scan plane. Only Cheng et al. have evaluated the measurement of PA thickness at both sagittal and axial planes by US at the maximum point of thickness. Several researchers tested the inter- and intraobserver reliability of PA thickness measurement previously by experienced operators considering measurement at the thickest points either in the sagittal or axial scanning planes   . To the best of our knowledge, no measurement of PA thickness at its different parts by US in living subjects is available in the literature. Ehrmann et al. measured PA thickness at its central, medial and lateral portions in 77 asymptomatic volunteers using a 1.5 T magnetic resonance imaging (MRI) scanner. Based on the anatomical nature of the PA with a thick, relatively wide structure having a relatively wide bony attachment to the calcaneus with multiple parts, we aimed to evaluate PA thickness measurement in healthy subjects by US in both sagittal and axial scan planes. One measurement in the sagittal scan plane (representing central fascicle) and two measurements in the axial scan plane (representing central and lateral fascicles) were compared to define normative values. We also aimed to test for the interobserver reliability of the above measurements between two musculoskeletal (MSK) radiologists with widely different levels of experience. Our institutional review board approved this prospective study. All participants provided informed written and oral consent before starting the examination. 40 healthy volunteers (23 females and 17 males; mean age: 34 years; age range: 18 – 74 years) were included in the study. They were randomly chosen from medical students, the working medical staff at our hospital and patients seeking medical advice for an MSK disorder other than a foot disorder (e. g., shoulder or hand examinations) and who had no symptoms regarding their feet. The exclusion criteria included subjects with systemic disease such as diabetes mellitus, rheumatoid arthritis or a metabolic disorder. Subjects with a previous history of plantar fasciitis, hind foot pain, trauma, surgery or treatments were also excluded from the study. Previous unilateral foot trauma was not an absolute contraindication, as we excluded only the previously traumatized foot and included the other regular foot. This case was seen in only one subject who had a history of previous trauma in one foot, which was excluded from the study. Therefore, the total number of feet included in the study was 79 feet in 40 healthy subjects. All participants underwent US examination using a 5 – 18 MHz linear array transducer fitted with a US scanner (HI Vision Preirus, Hitachi Aloka Medical, Ltd, Tokyo). They were examined by two radiologists with different levels of experience; the first one was a senior MSK radiologist (..) with 10 years of MSK radiology experience and the second was a junior MSK radiologist (..), who had just started his MSK US training 4 weeks before the start of the study. Immediately prior to the start of the study, the junior radiologist was taught the technique and how to get the best scans for measurement of the thickness in both scan planes. For this purpose, 10 healthy subjects, whose results were not included in the study, were recruited and examined by both examiners. The study was started as soon as it could be ascertained that the junior resident was able to perform the examination efficiently and independently. Measurements were carried out according to the recommendations of the European Society of Musculoskeletal Radiology . Subjects were asked to lie comfortably in a prone position on the examination table. Their knees were extended and a long cylindrical pillow was put under their ankles resulting in a small angulation of the knee to keep the subjects and their feet as comfortable as possible. Measurement of the PA in the sagittal plane was done just distal to its bony insertion into the calcaneus (about 5 mm distal to the calcaneal insertion). Then the transducer was turned in a counter-clockwise direction carefully and slowly while trying to get an axial image of the PA at the same point as for the previous sagittal scans. The PA thickness was measured like this at two different points; the first at the thickest point in the medial portion of the PA and the second at the thickest point in the lateral portion. Each examiner performed the examination in the same order and each measurement was repeated three times. The mean of each was used for data analysis. Each examiner was blinded to the results of the other. Results were evaluated and compared per foot (PA measurements). A spreadsheet with the measured values of each test subject was created using Microsoft Excel 2010 (version 14.0, Microsoft Cooperation, USA). It included measurements of PA thickness in both the sagittal and axial (medial and lateral) scan planes. These measurements were listed for each foot and each examiner. Values are given as mean together with standard deviation and range. The interrater correlation was calculated using the Bravais/Pearson correlation coefficient provided by Microsoft Excel. To test for normal distribution of the data, a Shapiro-Wilk test was performed. As no normal distribution was found, a paired Wilcox test was applied to detect significant differences. These statistical calculations were performed using the R Project for Statistical Computing (version 3.03)  (version 3.0.3). Results were considered significant for a P-value less than 0.05. PA thickness showed the highest values for the sagittal scan plane (mean ± std: 3.2 ± 0.5 mm, range: 2.3 – 4.4 mm) compared to the axial medial measurement (mean ± std: 3.1 ± 0.7 mm, range: 2.2 – 4.9 mm) and the axial lateral measurement (mean ± std, 2.5 ± 0.5 mm; range: 1.8 – 3.7 mm). The difference was significant between the sagittal measurement and the axial medial measurement (P = 0.015) and highly significant between the sagittal measurement and the axial lateral measurement as well as between the axial medial and the axial lateral measurement (P < 0.001, respectively) ([Fig. 2], ). Fig. 1 Overall interobserver correlation between two examiners (ICC = 0.74). Abb. 1 Gesamt-Inter-Observer-Korrelation zwischen 2 Untersuchern (ICC = 0,74). Fig. 2 US of the PA in the sagittal scan plane with thickness measurement in a healthy female subject (thickness = 2.5 mm). Abb. 2 US der PA in sagittaler Aufnahmeebene mit Dickenmessung für eine gesunde weibliche Person (Dicke = 2,5 mm). Fig. 3 US of the PA in the axial scan plane of the same female subject as in Fig. 2. The medial portion appears thicker than the lateral, which was confirmed by thickness measurement (axial medial thickness = 2.6 mm and axial lateral thickness = 2.1 mm). Abb. 3 US der PA in axialer Aufnahmeebene für dieselbe weibliche Person wie in Abb. 2. Der mediale Anteil erscheint dicker als der laterale Anteil, was sich durch die Dickenmessung bestätigt (axiale mediale Dicke = 2,6 mm, axiale laterale Dicke = 2,1 mm). Subjects were divided into two main groups based on gender (46 female PAs versus 33 male PAs). The sagittal PF thickness was higher in the male group (mean ± std: 3.4 ± 0.5 mm; range: 2.6 – 4.5 mm) compared to the female group (mean ± std: 3.1 ± 0.6 mm; range: 2.2 – 4.7 mm). The axial medial measurements were also higher in the male group (mean ± std: 3.3 ± 0.7; range: 2.5 – 5.4 mm) compared to the female group (mean ± std: 2.9 ± 0.6 mm; range: 2.1 – 4.7 mm). Similarly, the axial lateral measurements were higher in the male group (mean ± std: 2.7 ± 0.6 mm; range: 1.8 – 4.8 mm) compared to the female group (mean ± std: 2.3 ± 0.4 mm; range: 1.7 – 3.4 mm). Although the difference between both genders was not significant regarding the sagittal plane measurements (P = 0.08), a relatively significant difference was detected based on gender differences in both axial medial and lateral measurements (P = 0.049 and 0.021, respectively). The PF thickness values for both gender groups including mean ± std and range of thickness are summarized in [Table 1], . Mean thickness of the PA in different scan planes for female and male subjects. Tab. 1 Mittlere PA-Dicke in verschiedenen Aufnahmeebenen für weibliche und männliche Personen. Range of thickness of the PA for female and male subjects. Subjects were further divided into two different groups based on age: group 1 (18 – 35 years, n = 59) and group 2 (50 – 75 years, n = 20). The PF thickness in group 1 (younger group) was significantly lower than in group 2 (older group) regarding all scan plane measurements (sagittal, axial medial and axial lateral measurements, P < 0.001). The values of PA thickness for both age groups including mean ± std and range of thickness are summarized in [Table 3], . Thickness of the PA for different scan planes for two age groups. Tab. 3 PA-Dicke in verschiedenen Aufnahmeebenen für 2 Altersgruppen. Range of thickness of the PA for two age groups. Tab. 4 Wertebereich der PA-Dicke für 2 Altersgruppen. We found a correlation between all obtained measurements and age. The correlation coefficient was 0.65 for the sagittal plane, 0.7 for the axial medial plane and 0.69 for the axial lateral plane. A good interobserver correlation between both examiners was detected for all obtained measurements (correlation coefficient 0.74) ([Fig. 1]). The detailed interobserver correlation for each parameter is shown in [Table 5]. Interobserver correlation coefficient (ICC) for two examiners and different scan planes. Tab. 5 Inter-observer-correlation-coefficient (ICC) für 2 Untersucher und verschiedene Aufnahmeebenen. As the most important part of the PA and the one most commonly affected by pathology, the central fascicle has been evaluated most often in the literature   . According to our results, however, the evaluation of the lateral fascicles for routine examinations must not be neglected. Moraes do Carmo et al. showed the anatomical features of the plantar aponeurosis in a cadaveric study conducted on 10 foot specimens using both US and MRI. In our study measurement of the central fascicle was performed in the sagittal scan plane and measurement of the central and lateral fascicles was performed in the axial scan plane. A mean value of 3.2 mm was shown for the sagittal scan plane measurement in our study, which is in accordance with the values in the literature       . An additional scan plane, the axial scan plane, was used in our study to obtain PA thickness measurement at medial and lateral positions. 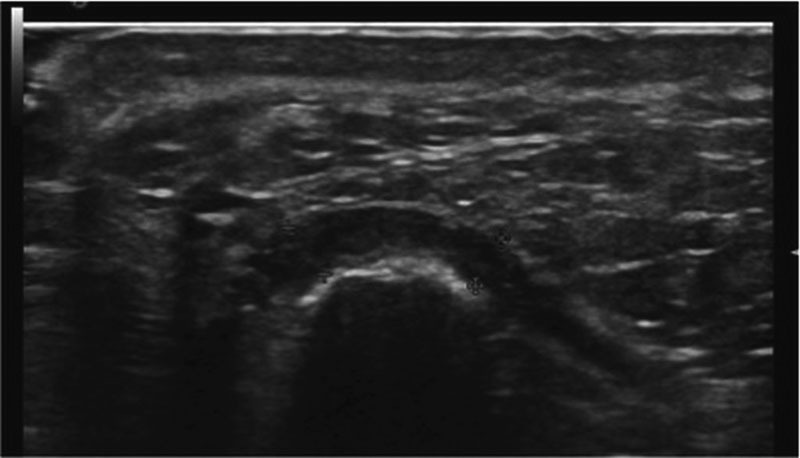 The medial position, which represented the central tendon, showed a mean value of 3.1 mm. This was also in concordance with our value from the sagittal scan plane and with the mean value obtained by Cheng et al. , who conducted a study on 11 patients and 26 volunteers studying the reproducibility of US measurement of PA thickness. To the best of our knowledge, this was the only study that evaluated PA thickness in both sagittal and axial scan planes using US. No previous studies have studied the lateral fascicle by US except for that of Moraes do Carmo et al. , who evaluated the lateral fascicle of the PA but in the sagittal scan plane only. They registered a mean value of 3.1 mm, which was higher than our observed mean value (2.5 mm). This may be attributed to the difference in the study subjects included, as we recruited healthy subjects, but they recruited cadavers without including any information about their ages or previous medical conditions. The process of preserving the feet of cadavers until the time of examination may also affect the nature of the tissues and result in differences or deviations from the normal tissue characteristics. Our results of central and lateral fascicle thickness measurements are slightly lower than the results of Ehrmann et al. , who showed values of 4 mm and 2.3 mm for the central and lateral fascicles, respectively, using MRI. Slightly higher values of MRI compared to US were also shown in the study of Moraes do Carmo et al. .
We showed a highly significant difference between the sagittal and axial medial measurements compared to the axial lateral measurements, which is concordant with the anatomic structure of the central and lateral fascicles of the PA. A significant difference between both the sagittal and axial medial measurements might be explained by the difference in the scan plane, because it is challenging to get exactly the same point for the sagittal and axial measurement, despite careful and slow transducer movement from sagittal to axial. Furthermore, it is difficult to detect the thickest point in the axial scan plane in contrast to the sagittal scan plane due to a lack of precision of the axial measurement. The effect of many factors, such as age, gender, and body weight, on PA thickness has been shown in several publications and was confirmed for gender and age in the current study. All obtained measurements in the sagittal and axial scan planes showed higher values of the 33 PA male subjects compared to 46 PA female subjects. The difference in the sagittal plane showed no significance (P = 0.08) between the male and female groups but showed marginal significance (P = 0.049) regarding the axial medial measurement and significance regarding the axial lateral measurement (P = 0.02). Such findings may express the importance of studying all components of PA in more than one scan plane. The axial scan plane may include additional values that may not be presented by the sagittal scan plane. Although these results are partly not in agreement with the results of Uzel et al. , who showed a significant difference between both genders in a study conducted on 110 patients, we may attribute this to the difference in the study population. They incorporated only young subjects (range: 20 – 30 years), but we incorporated subjects with a wider age range (18 – 74 years). Our results regarding the insignificant difference in the sagittal scan plane measurements are consistent with Pascual Huerta et al. , who showed significant differences between both genders only at the measurement point 1 cm proximal to the PA insertion, but not at 1 and 2 cm distal to the insertion point. According to our protocol of examination, our sagittal scan measurement point corresponds to the point 1 cm distal to the PA insertion used by them. Therefore, our results are considered consistent with their results. Our results for PA thickness regarding the two different age groups (younger and older) showed highly significant lower values in all scan plane measurements in the younger age group compared to the older age group (P< 0.001). Also, a correlation with age was shown for PA thickness in the different scan planes. This is in contrast to Pascual Huerta et al. , who concluded that age does not play a significant role in PF thickness in healthy subjects. Such correlation with age may be explained by degenerative changes that may affect PA with age. We aimed in this study to test for the interobserver reliability of the technique between two radiologists with highly divergent levels of MSK US experience. Our results showed good interobserver correlation between both examiners regarding all obtained measurements (correlation coefficient 0.74). The correlation coefficient was 0.7 and 0.62 for the sagittal and axial medial scan plane measurements, which are slightly lower than the results of Cheng et al. , who showed values of about 0.78 and 0.76 for the sagittal and axial scan plane measurements at their first examination. In another study performed by Johannsen et al. , conducted on 17 patients suffering from heel pain, they showed excellent interobserver reliability using the mean of two measurements (ICC 0.85 – 0.95). The dependence of ICC on the variability of the measurements, which means a higher ICC is expected in a heterogeneous group, whereas a lower ICC is expected in a homogeneous group, should also be noted . Such a proposal may explain the reason for lower correlation coefficient values in our study compared to the other studies. Rathleff et al. showed the value of multiple measurements compared to a single measurement. They showed a higher interobserver correlation (0.82) using three measurements compared to single measurement (0.62) in a study conducted on 20 healthy volunteers. Accordingly, in our protocol we performed three measurements at each examination point and used the mean of those three measurements for our data evaluation. We hypothesized that this approach might help to overcome the wide range in experience between the two examiners in our study. 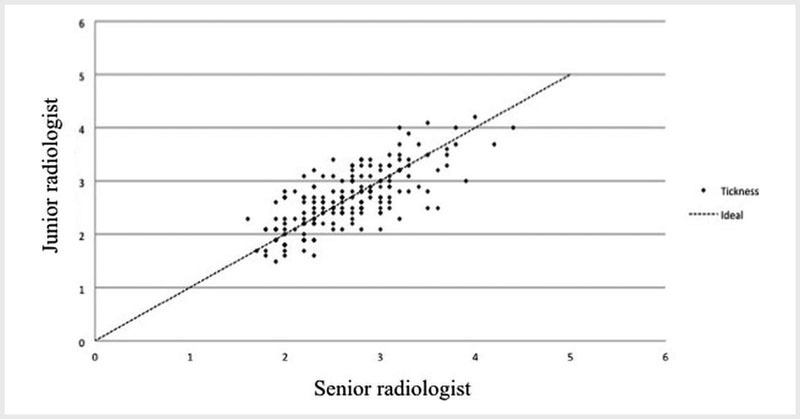 The good interobserver correlation found in our study may emphasize the easiness and applicability of PA thickness measurements even by junior radiologists, who are beginning their MSK US career. There are some limitations to our study. Firstly, we evaluated only PA thickness without the inclusion of other US findings, such as calcifications, echogenicity or fluid collection. We correlated our findings only to age and gender differences and excluded other factors, such as body weight and body mass index. Weight and body mass index have been discussed in several previous publications  . However, age and gender have not been sufficiently studied except in only a few publications. Our study may be considered a replication of previous studies, but it entailed more detailed anatomic examinations of the PA and its changes in thickness based on age and gender. It was also the first to show the fast and reliable learning curve of PA thickness measurement by US. To the best of our knowledge, our study is the first to examine the PA in two different scan planes and present three different measurements, which may be more in accordance with and representative of the complex anatomic structure of the PA. It is the first study that shows the interobserver correlation between an experienced examiner and a junior examiner just starting his MSK US career. In summary, our study presents a different proposal of PA thickness measurement. Although sagittal measurement is the most common approach found in the literature, our results support the combination of both sagittal and axial approaches to avoid missing any possible changes in the lateral fascicle. Age correlates with PA thickness, a finding that may be considered during routine daily work. Although US is highly operator-dependent and requires a long learning curve, measurement of PA thickness seemed to be a simple and easily achieved task that can be done efficiently after a short training course.